You can’t be in and around Traverse City, Petoskey or all of Northern Michigan without recognizing that the our options for engaging in arts performances are as diverse, energized and impressive as most places in the country. Here’s a peek at what you’ll find this fall. Dive in! Many international touring acts are planned to grace the stage at Milliken Auditorium this season, including Scottish traditional band Tannahill Weavers (Oct. 2) and Chinese acrobatic company Golden Dragon Acrobats (Oct. 22). Other performances include rising jazz vocalist star Somi (Oct. 29), the estrogen-fueled musical revue Four Bitchin Babes (Nov. 12), rapid-fi re tap dance ensemble Rhythmic Circus (Nov. 19) and many more. On the gallery side, the museum’s major exhibition this fall is “Celebrating Women” (Sept. 19–Jan. 2), honoring women’s roles, rites of passage and spiritual lives. The exhibit will include works by photojournalist Paola Gianturco and textile designer Anita Mayer, fabric pictures created by Peruvian women’s art cooperatives, and special workshops and programming. 231-995-1055, DENNOSMUSEUM.ORG. This Warehouse District gallery is the place to go for pop surrealist, low-brow and outsider art installations—but it’s also a great venue to catch film nights, festivals, and touring music acts in a wide range of styles, including jazz, blues, folk, Americana and world music. Upcoming events include an opening by Detroit artist Tony Roko (Sept. 17), folk duo Nervous But Excited (Sept. 24), a Detroit vs. Chicago comedy festival (Oct. 1 and 2), and “Postcard Diaries: The Visual Art of Mark Mothersbaugh,” best known from the 70’s band DEVO (Oct. 8). The gallery is open to the public during its regular hours Tuesday through Saturday. 231-929-3254, Inside Out Gallery on Facebook. An intimate, volunteer-based venue for amateur theater, Old Town Playhouse has been a stalwart in the TC arts scene for more than 40 years. The 2010-2011 season kicks off this month with the energetic musical, The 25th Annual Putnam County Spelling Bee (Sept. 10–Oct. 7). Also in this season’s lineup is Irving Berlin’s White Christmas (Nov. 5–27), Duck Hunter Shoots Angel, by acclaimed Michigan writer Mitch Albom (Jan. 14–29), the classic musical Fiddler on the Roof (Mar. 4–29) and several others, in addition to original plays and children’s theater. Tickets available online and at the box office, which is open Monday through Friday, 4 p.m. to 6 p.m., and two hours before each performance. 231-947-2210, OLDTOWNPLAYHOUSE.COM. Charismatic, high-energy conductor Kevin Rhodes joined the Traverse Symphony Orchestra in 2002, taking the half-century-old orchestra to new, critically acclaimed heights. Each season, the orchestra presents several classical and pops symphonic programs, featuring renowned guest artists from the national and international stage. First up this fall is “Fantastique!” (Oct. 24), featuring two classical music favorites by composers Hector Berlioz and Paul Dukas. 231-947-7120, TRAVERSESYMPHONY.ORG. Downtown Traverse City’s grand Victorian performance space has undergone many transitions in its 118-year history, but few as potentially game-changing as its new partnership with Michigan State University’s Wharton Center for the Performing Arts. The 2010–2011 Auto-Owners Insurance Performing Arts Series—the City Opera House’s first series partnering with Wharton Center—kicks off this September, continuing the opera house’s long tradition as a cultural gem in the North. The line-up this season includes jazz, dance, classical, comedy, a family musical and variety entertainment. A few choice picks? Award-winning vocal jazz group Tierney Sutton Band (Sept. 30), River North Chicago Dance Company: Miles Davis Commission (April 5), Last Comic Standing Live Tour (Nov. 7), and Grammy award-winning all-male chorus Chanticleer (Mar. 4). One insider tip: Become a series subscriber to get the best seats at low prices, while enjoying priority seating before the general public, ticket discounts, and other perks. 231- 941-8082, CITYOPERAHOUSE.ORG. This 50-person wind ensemble, open to all ages, plays a variety of music—classical, modern compositions, marches, pops, classic American favorites. The group also hosts an annual Young Artist Solo Competition that awards a scholarship to one standout high-school musician. Performances for its 21st season include “Hands Across the Sea” (Oct. 9), “Holiday Classics: Holly & Mistletoe” (Dec. 18), and “Sounds of Freedom” (May 22). (231) 486-7200, ENCOREWINDS.ORG. A tucked-away Northwoods creative hub, Interlochen Center for the Arts is known by many for its blockbuster annual summer concert series, but Interlochen continues to offer a killer lineup of art and entertainment even after the summer crowds have gone. A major plus? Off-season audiences mean smaller venues, like Dendrinos Chapel and Corson Auditorium, giving you a decidedly more intimate experience at these top-notch shows. And the average price is yet another bonus—for the fall-winter series, tickets range from $9 to $30 for most events. This year, the fall-winter season at Interlochen kicks off with a bang on September 30 with all-star singer-songwriter Jason Mraz, followed by the biannual Collage, a popular semi-annual production starring Interlochen Arts Academy students, on October 7 and 8. From there? 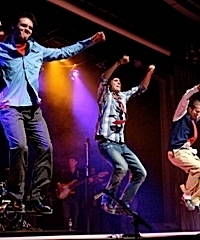 It’s a broad spectrum of slam-dunk entertainment, including Project Trio, an innovative classical music group featuring an Interlochen alumnus on cello (Oct. 21); Benny Green, an exceptional solo pianist (Nov. 4); internationally renowned South African vocal group Ladysmith Black Mambazo (Feb. 20); student productions of Sleeping Beauty (Dec. 10–12), Dirty Rotten Scoundrels: The Musical (Nov. 19–20, Dec. 3–5), and Beauty and the Beast (May 13–14); and the wildly entertaining World Famous Popvich Comedy Pet Theater (Feb. 17), among many others. Now’s the time to get your season tickets; it’s not uncommon for shows to sell out. 231-276-7800, INTERLOCHEN.ORG. After the uproariously great time we had at the very first Traverse City Comedy Arts Festival, held last February, we hoped the fest would come back for another run this season. Well, it’s official: The second annual Comedy Arts Festival is a go, scheduled for February 10–12, 2011. Last year’s shindig, organized by the same folks who turned the TC Film Festival into a wildly successful annual event, was a bright spot during the midwinter doldrums, with big-name comedians, up-and-coming acts, hilarious flicks and sketch comedy. Can’t wait for the laughs in store for us this time around. 231-392-1134. This year-round book festival is both a literary celebration and a scholarship program for emerging young writers. Founded in 2009 by a group of notable locals—New York Times bestselling author Doug Stanton, journalist Anne Stanton and attorney Grant Parsons—the National Writers Series is dedicated to bringing to life conversations with authors, journalists, and premier storytellers, through monthly up-close-and-personal talks and workshops. Past participants have included literary luminaries like legendary news anchor Tom Brokaw, Wall Street Journal Chicago bureau chief Bryan Gruley, and memoirist Mary Karr. Net proceeds from events are donated to a dedicated scholarship fund for high school students, through the Grand Traverse Regional Community Foundation. For information on upcoming guests and events, visit NATIONALWRITERSSERIES.ORG. Want to grab dinner before a performance? Find all your options in the MyNorth Restaurant Directory.